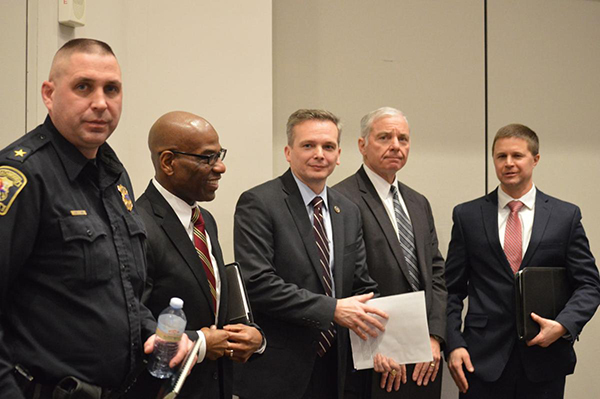 From left, Beachwood Police Chief Gary Haba; Leroy Morrow, certified protection professional at LMJ Services LLC; FBI Assistant Special Agent Bryan Smith; Jim Hartnett, Jewish Federation of Cleveland director of community wide security; and William Werner, FBI supervisory special agent. 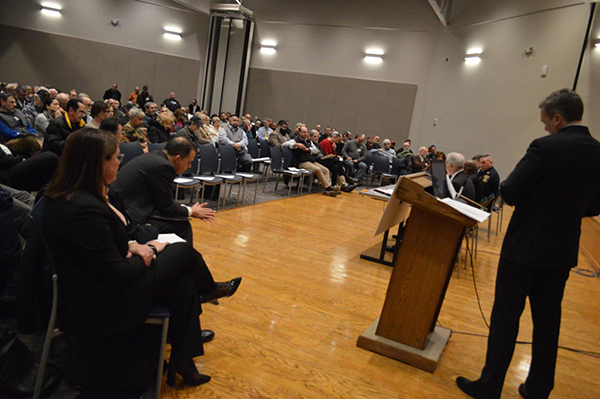 Members of synagogues, churches and mosques listened to law enforcement officials and security professionals, watched video footage of crimes and emergencies Jan. 29 at the Mandel Jewish Community Center in Beachwood. The presentation, called “Safe and Secure: Protecting Your House of Worship,” drew about 250 people for the two-hour presentation on a night when temperatures outside dipped into single digits. Topics covered included preventing and responding to active shooting incidents, security best practices and identifying and reporting hate crimes. The presentation was jointly sponsored by the Jewish Federation of Cleveland, the U.S. Department of Justice, the FBI and the Anti-Defamation League Cleveland. The presentation happened to take place the same date as Damon Joseph, 21, of Holland, Ohio, was indicted following a plot to shoot two synagogues in the Toledo area. His arrest on Dec. 7, in part, prompted this event. His three-count indictment included attempting to provide material support to ISIS, attempting to commit a hate crime, and possessing firearms in furtherance of a crime of violence, according to the U.S. Department of Justice. Bridget Brennan, first assistant U.S. attorney in the Northern District of Ohio, told the Cleveland Jewish News Joseph’s indictment represents a first. During the presentations, Joseph’s case was related to the audience, along with the case of the burning of a prayer rug inside a mosque in Toledo. U.S. Attorney Justin Herdman told of the founding of the U.S. Department of Justice, which was formed to combat the Ku Klux Klan in the South. He said that instantaneous moments of denial can result in loss of life, and showed footage from the Bataclan Theatre shooting in Paris, where a guitarist on stage momentarily froze and was subsequently shot. “The problem is with this denial,” he said. “Denial is going to cause delay, and delay costs lives. He spoke of the “run, hide, fight” response, and said hiding means taking shelter in a secure room, pulling shades and, if possible, having covert communication with police. A panel on security best practices stressed using every tool available. They also spoke of the importance of developing relationships – and sharing information – with local police so that police are familiar with their buildings prior to an emergency. Relying too heavily on any one tool can lead to disappointments, the panelists said, and they suggested taking advantage of training offered by local police. William Werner, FBI supervisory special agent, said it is important to report suspicious activity. “You don’t want the first time you interact with an officer to be in an emergency,” he said. Beachwood Police Chief Gary Haba talked about the importance of sharing floor plans of houses of worship with police. “In case of a major incident, that’s helpful,” he said. Morrow suggested sharing keys to buildings with local police. Hartnett suggested starting with the most likely scenarios, rather than the most challenging ones, such as medical emergencies, fire or flood. Monitoring security cameras to make sure they’re recording properly is also important, the panelists said, so is making sure that more than one person has access to the film. “The one man or woman who has access is always in Texas or Hawaii,” Haba said. While Ohio does not have specific hate crimes laws, Russell W. Tye, co-criminal chief at the Cuyahoga County Prosecutor’s Office, spoke of the state statutes that can be used in such incidents. Anita Gray, ADL director of development, spoke of the importance of civil rights groups in helping victims of hate crimes, and encouraged people to call them for help if they are victims. She encouraged victims to remember the words of perpetrators, particularly slurs. “Words, as you’ve heard, are very important,” she said. Walled Hezam, who goes to the Islamic Center of Akron, said he was grateful to the organizers for the informative presentation that will help protect houses of worship. “Working together allows us exponentially greater amounts of information than we would all have siloed to ourselves,” said Wayne Elliott of Kent, who belongs to Temple Israel in Bath Township and came with two other members of that congregation. Mary Pat Frey, a parishioner of St. Albert the Great in North Royalton, said her church recently started an emergency plan and needs to finalize it. Copyright 2019 Jewish Federation of Cleveland. All Rights Reserved.